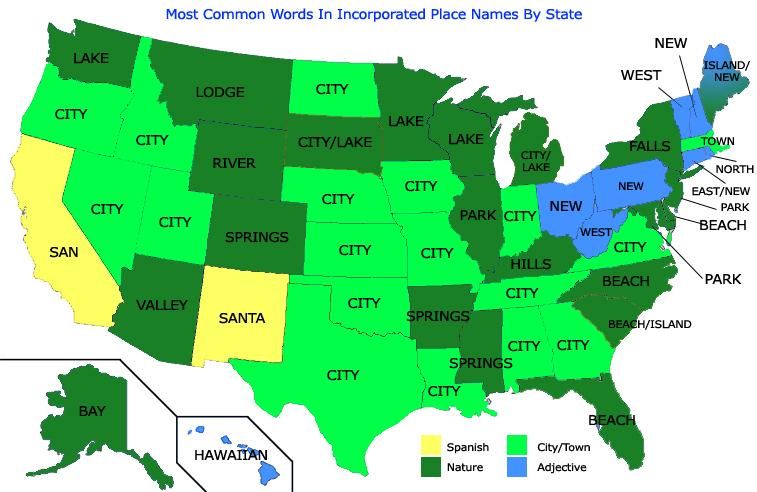 However, there a few interesting outliers, for example the most common word in West Virginia’s place names is ‘west.’ To make sure people know they’re in Hawaii, a lot of place names include the word ‘Hawaiian’. And people in Montana seem to like the word ‘lodge’, a lot. Less surprising, New Mexico and California both have a lot of place Spanish originating place names. Note that the word had to be a separate word, so ‘Lakeville’ or ‘Bearcreek’ did NOT have ‘creek’ or ‘lake’ counted for them. Indeed, although you’d think they might also just go with garden.